I have been away for a bit, but I am back! I moved to the US in the new year and didn’t have a work permit (I am Canadian), but that is all settled now and I am back in action. While I was “away”, however, I started up a video podcast on my YouTube channel. There are already 6 episodes for you to binge watch (or casually watch when you have the time). There isn’t a lot of hookabee content in them yet, but that will change now that I am back in business. 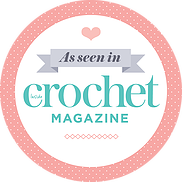 Mostly, I talk about my knitting, crochet, and sewing adventures that I get up to during my spare time. There also hasn’t been a new episode in a few months due to crazyness in my personal life, but I am planning to film one asap. Unfortunately, the online video editor I was using previously does not exist anymore, so I need to find an alternative, which may delay things a bit – but I have some ideas! I hope you enjoy getting to know me and my crafts!